I like the new blue too. Ordered right after I saw it…was thinking green before, but the new dark blue sealed the deal. From the video, it looked like the switch LED’s were blue…so that will look awesome! well i like the new blue but i ordered desert tan what series is that? any more specs for us? update: well it apparently called HaikeLite SC26 Fatty. I did not take a comparasion photo with MT09R black and blue side by side today, It's already night here. I attach a new haikelite prototype for reference. MT09R new blue is the same blue as blow. I think you can see the difference. !http://www.haikelite.top/product/pics/20180119/201801191516367961609.jpg! !http://www.haikelite.top/product/pics/20180119/201801191516368020595.jpg! He is correct... as soon as Dale agrees to release the specs and other information I will let you know right away. It is probably a month away from time that it will be offered for retail sale. If I remember correctly it's offical introduction is set for February 1st. I like the new blue too. Ordered right after I saw it...was thinking green before, but the new dark blue sealed the deal. From the video, it looked like the switch LED's were blue...so that will look awesome! The switch is is blue color when turned on.. I ordered and payed for deep blue which is unique and better for me and now You change the color? Navy blue looks like boring gray. I ordered Deep Blue and don’t want any other color. You should consult that decision before it becomes a fact. Deep blue looks better than navy blue…. navy blue looks like gray. Can You make deep blue? I'm sure that of you want to change the color for your order that will not be a problem. Paid 100 USD for Balance Payment (Post: #16), and 1 Pcs. Charger. This would be wonderful, I hope you can make it happen. In the USA, Mountain Electronics sells some Haikelite products, but not a wide selection. Maybe you could partner with them or illumn.com, to offer more products and some aftersale support. Both are first rate dealers. Or perhaps someone that sells only that Haikelite Brand in their flashlight area... That would give you the best service possible... Their only interest would be to be sure that the brands customers get the best service possible. 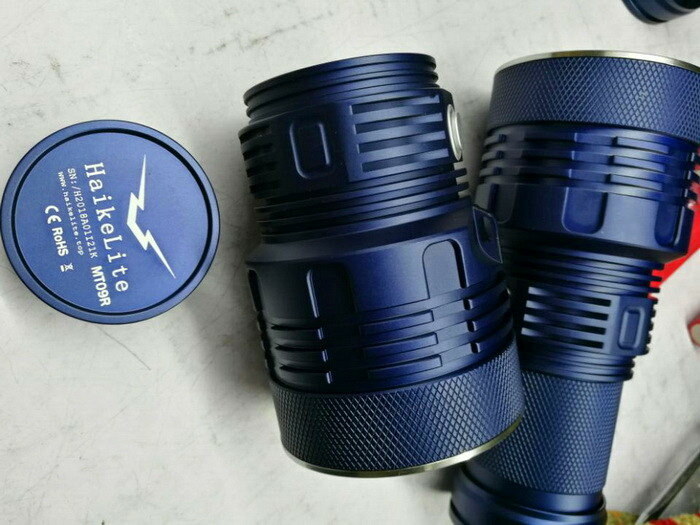 Just checking on the update.. from my understanding, haikelite boss mentioned they will ship out the dark blue if you paid for them already. Am i correct? What will happen if the orders will be less then 300 total, they will still ship out to all that bought lights or? Put me down for one Blue XPH 70.2 NW, Please add charging unit. Paid in Full through Pay Pal. We will ship out the custom-color pre-orders before 31th Jan.
That actually is a much much better shot... Dale if it is possible send my 35 high sample in that color... Unless it is too late..
Total completed payment today: MT09R triple 70.2 USD125.00 4*18650 Button top Sony VTC6 3000mAh 30A USD20.00 Black NW (Neutral White) Charging unit 4 18650 cells $10.00. okok great to hear hope everyone will order before all gone! I prefer the new color in this image than in the previous picture. I have paid the full price of MT09R with new blue color. Well I changed my order a bit, as I’m not a fan of the new navy blue. At first I wasn’t a fan but newer pictures look great and now I prefer the new color. I just finished paying in full for mine with batteries and charger. Anybody else get an email from Haikelite confirming order and shipping address? Ya…just now…as I was reading your post…ha!